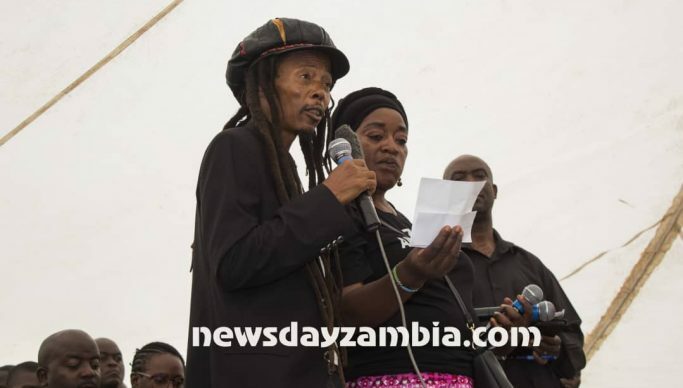 Veteran reggae artist Maiko Zulu has accused government of not being supportive of the music industry despite artists being equal partners in national development. Giving an eulogy Brian Chilala’s funeral service at the Cathedral of the Holy Cross today, Maiko accused government of not respecting artists even though they contributed towards safeguarding the country’s culture and preservation of morals. “I have been given something to read but I am not good at reading. I want to say get some of those buildings that are gotten corruptly and turn them into music schools,” he suggested, amid loud applauds and chants of “give us iwe! and pamene apo” (just there!) from other musicians who attended the gathering. Maiko said it was sad that musicians had to scrounge for a tent and yet Bryan was a successful artist who employed others and not a beggar. “When Musicians call, for example on honourable Lubinda, honourable Hamukale, honourable Kapata for assistance in certain areas, it doesn’t mean we are beggars. We are not paid by any government institution. We work so hard. We have worked so hard to build this art industry in this country, which all of you here are enjoying,” he said. He added that “when you sit in your cabinet meetings honourables, you sing the national anthem…that’s a piece of music. When you are having your funerals, your parties, weddings, you call on artists. We have built this country together with you but unfortunately the arts sector is not receiving its fair share of the deal from this pie called government”. “Ask any musician, any actor, we are not benefiting from these institutions. Some of these institutions are even claiming funding in the name of artists. There is a chunk that comes from the Ministry of Finance to the Ministry of Tourism and Arts but the ‘arts’ is in small letters” he said, pointing out that the national arts council is not funded and is currently getting “peanuts,” he stressed amid loud applause. Maiko said he would not apologise for asking for what belongs to them, stressing that his speech was not a political statement but purely an artistic one, before declaring the gathering a state funeral, as he had been customary known to declare during funerals of prominent Zambian musicians. And as if in an act of remorse, Minister of Lands Jean Kapata acknowledged Maiko’s speech and told the crowd that government had heard the plea of the musicians. “We have heard as government that you are not getting your fair cake. Music delights Zambians. Through Music we relay a lot of messages so through the president of the republic of Zambia, as Minister of Lands, I would like to pledge a piece of land to the musicians” she said as the crowd went wild before adding that “I will ask the president of ZAM to write an application letter so that you can build your auditorium because we believe that music is very important in this country and we treasure it, we dance everywhere we go” she added. And speaking earlier, Zambia Association of Musicians (ZAM) president Tivo Shikapwasha said Brian Chilala was not just a legend but a hero in the Zambian music fraternity. “He set the way for many of us, shining a legacy of whoever would be a part of Zambian music. The association of musicians has mixed feelings today. On one hand we feel a deep sense of sadness and sorrow and we feel a deep sense of pride and honour in the achievement that our hero has given us,” he said. Shikapwasha said though Brian is gone, his talent would continue to live on and inspire many but complained that “it is unfortunate that the venue which was originally set for the late artists send-off opted to charge us a fee. We would like to thank honourable Kapata for helping us to find an alternative venue”. “To fellow Musicians let us learn from Brian Chilala’s long commitment to improving the arts. He gave through his talent, in a selfless manner and proudly carried that authentic indigenous sound everywhere he went,” he said. The funeral was attended by multitude of Zambians who included ministers like Professor Nkandu Luo, Edify Hamukale, Moses Mawere, Given Lubinda and Jean kapata. Brian Chilala died in the late hours of Sunday 10th February in a road traffic accident along Lumumba road in Lusaka. The legendary musician had just rekindled his road show act and was scheduled to hold a show in a week after a long break.